Experience the luxury of this 4-bedroom FULLY FURNISHED vacation home nestled in the highly sought after community of CHAMPIONSGATE Resort. Your beautiful home offers 2 en-suites, 2 additional bedrooms with a shared bathroom and a premium furniture package. Wander into the beautiful kitchen where you will discover upgraded STAINLESS STEEL appliances, GRANITE counter-tops and amazing cabinetry. After enjoying a meal you can settle back in front of one of the many flat screen televisions or soak up those unforgettable Florida days and nights lounging out by the pool. Keep shaded under the lanai, lounge out in the sun or take a dip in your PRIVATE heated pool and spa! Dont forget to spend some quality time at THE OASIS clubhouse (12,000 sqft) where you have access to a stunning community pool, lazy river, air-conditioned cabanas, restaurant, fitness room, cinema, tennis courts and other high-end amenities. Want more? Your monthly HOA dues cover 24-hour monitored/gated security, cable television, internet access, yard maintenance and much more. 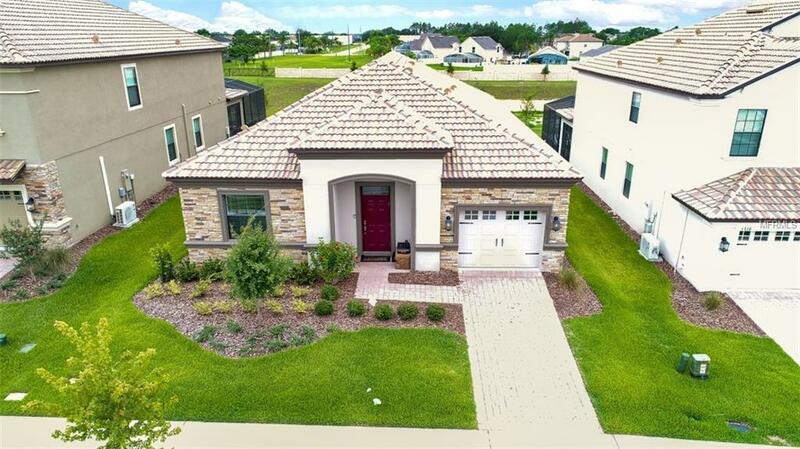 With easy access to Interstate 4 you have an easy commute to the theme parks, shopping, dining and the airport. Take advantage of this tremendous opportunity in ChampionsGate Resort and have a look at this amazing home and community! You will not be disappointed! Listing provided courtesy of Jc Penny Realty Llc.